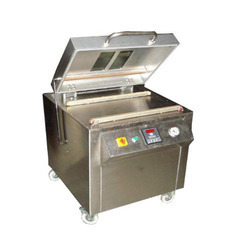 This machine is vacuum sealing machine or remove air machine. 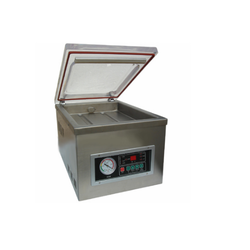 Vacuum chamber are specially designed for removing the external bacterial and other air virus. This machine are used for pouch sealing, bag sealing, seal, blanket sealing and grains packaging. This machine are very high equipment of machine. • Ideal for large volume of pouch packing. • World class German technology. • Fast sealing of nitrogen flashing machine. • Easy to use and low maintenance. Construction : All Stainless Steel 304. Vacuum Chamber: Stainless Steel 304 and Mild steel cabinet. Lid: Transparent Acrylic to observe the complete process. Vacuum Pump: By default 250 or 600 Liters / Minute. Sealing Bar: 620mm Long 1 number or 340 X 2nos. Packing cycle: 15 to 35 seconds depending upon the product & vacuum pump. Electric Consumption: Less than 1 kw. Being leaders in the market, we are manufacturing, trading, distributing, retailing, importing and supplying a precisely design Chamber Vacuum Packaging Machine. Removes all the air from the pouch before sealing, the offered packaging machine is designed using top quality raw material and modern technology under the guidance of our skilled professionals. Moreover, our clients can avail the offered packaging machine from us at nominal rates. 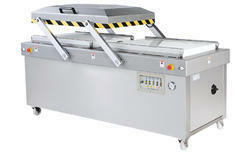 Pioneers in the industry, we are offering an excellent quality Small Vacuum Packaging Machine. 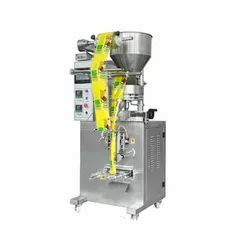 Used for pouch sealing, bag sealing, seal, these packaging machines are provided in various specifications in order to meet the variegated needs of clientele. 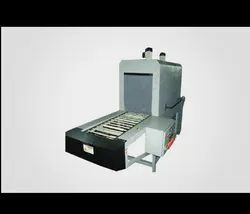 Along with that, these packaging machines are quality tested on numerous parameters by our accomplished professionals. Moreover, we provide these packaging machines to our client at the most affordable rates. Our organization is counted among the most trusted business entities, offering optimum quality Single Chamber Vacuum Packaging Machine. Manufactured using the top quality of material and advance techniques, our offered packaging machine is available in various sizes and other related specifications on customer’s demand. As well, this packaging machine is properly checked on various parameters to assure its flawlessness. Looking for Vaccum Packaging Machine ?